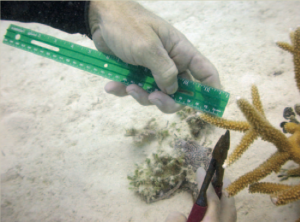 In order to populate field and land-based nurseries, coral fragments must be obtained from wild populations. This can be done by gathering corals of opportunity, which are coral fragments or detached colonies that have been created by disturbances and have little chance of surviving unless stabilized. Coral fragments can also be collected by taking small portions of intact wild donor colonies in natural reef habitats. Establishment of a coral nursery should have very minimal effects on wild populations. Many events or disturbances may provide the chance to collect corals of opportunity. For instance, coral fragments may become available after coastal construction activities, storms, vessel groundings, or anchor damage. Coral fragments generated from these disturbances will likely have better survivorship if they are secured back to the reef with current outplanting techniques or moved to nurseries where they can be outplanted later. Existing wild populations – gather knowledge from local communities, published research or reports, and others knowledgeable about potential location for wild populations within the reef system. Proximity to nursery site – sites closer to the nursery will allow for easier transportation of coral fragments and less mortality due to transport. Ideally donors will be no more than 30-60 minutes away from the nursery to reduce stress during transport. Number of sites – use as many sites as feasibly possible. This will spread out the impact to wild populations and increase the potential for higher genetic diversity. Permitting – be familiar with local permitting requirements and regulations, and speak with permitting agencies and government officials about approved collection areas. Most coral restoration projects that focus on population enhancement and propagation work exclusively with branching corals of the genera Acropora and Pocillopora. However, more research is being done on techniques to rear massive or boulder coral species in nurseries. The choice of coral species to collect and rear in nurseries should be dictated largely by the goals of your program, species availability, and the permitting or governing agency. Coral species should be determined prior to nursery site choice and establishment, as some species will have different needs in terms of environmental and site characteristics. Rearing a mixture of coral species, genotypes, and growth forms may reduce the risk of losing all nursery and outplanted corals during environmentally stressful events. Collecting coral species from environments similar to the nursery or to the eventual transplantation site can also reduce these risks. Further information on the importance of genetics for coral restoration and available genetic methods can be found in the Coral Genetics Webinar. Consideration should also be paid to the donor corals being collected and methods used for sourcing corals from reef habitats. The overall goal is to collect corals for the nursery while causing minimal damage to the reef habitat. Corals of opportunity are the most easily accessible sources of corals, and can simply be collected from reefs by picking up fragments, placing them in a container such as a plastic Tupperware bin, and transporting them to the nursery. 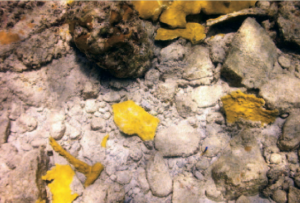 It is important to avoid corals with signs of disease (e.g., tissue sloughing off skeleton), recent mortality, or boring sponges, to minimize introducing these organisms into a nursery. If corals of opportunity include large colonies, small portions of the colony that appear healthy can be collected. Coral fragments can also be sourced by fragmenting small portions of wild donor colonies. For branching corals, fragments can be generated using stainless steel bone cutters, diagonal electrical wire cutters, needle nose pliers, or PVC cutters. Cutting the branch cleanly and evenly can help to ensure optimal survival of the fragment as well as healing and recovery for the donor colony. For Acropora cervicornis, up to 10% of a colony can be fragmented with no negative effects to the donor colony. ref Collections should be taken from healthy colonies that have healthy coloration and high tissue cover (90-100% live tissue cover across the whole colony). To reduce stress on wild donor colonies, fragment collection should occur during the cooler months when temperature stress is lower (e.g., December through May in the Caribbean). To ensure that little adverse effects have occurred on natural reef habitats, it’s advised that donor colonies be tagged and monitored after collections have been made. This can also be useful for tracking and maintaining different genotypes in the nursery. This can be done using a GPS and marking the substrate adjacent to the colony with a unique marker or tag. Data to be collected during the initial fragmentation event should include: colony size (maximum diameter and height), percent live tissue (to the nearest 10%), and colony condition (e.g., lesions, predator or damselfish presence). Numerous methods have been tested for transporting coral fragments to nurseries, but the best method ultimately depends on logistics at each site such as how far away the nursery is from the donor site. Fragments should not be moved to a field-based (in situ) nursery that is more than 500 km away from their original location in the wild. Fragments are often placed in watertight bags, plastic bins or buckets to provide an easy and secure method to transport fragments while also keeping different genotypes separate. To ensure maximum survival of fragments, transportation to a nursery should occur as quickly as possible after collections have been made. Fragments should be kept in water during transportation to nurseries. Measures should be taken to avoid excessive heat stress or sun exposure by refilling buckets with fresh saltwater and keeping corals shaded.